It presents a panoramic view of one of the most beautiful lakes in the Southwest. It is close to all the amenities, activities, and adventures of the memorable Lake Powell. It is truly a magical spot to camp or to park your RV. This is ARAMARK�S Wahweap Campground/RV. One weekend in late October, my husband Jim and I were guests of ARAMARK at Lake Powell, and since we are RVers, one of the highlights for us was a tour of the full-service Wahweap Campground/RV. We were impressed. It is a remarkable facility, set high above the lake. There are 90 full hookups plus 112 tent or non-hookups, and more are planned. In addition, there are pull-through spaces, grills at each site, tent camping, and group tent sites. Every need of the camper and RVer has been anticipated and met at Wahweap Campground/RV. There are immaculate showers and laundry facilities. There is a very attractive and convenient store/office, The Lower Campground Store that is a great place to shop for Lake Powell apparel, books and gifts, snacks, as well as grocery and sundry items. In addition, there is a convenient dump station, and there is drinking water. Clean. Green. Those two words came to our minds as we viewed the bristol facilities and the perfectly groomed campground. The commitment to keeping the natural beauty of the area untarnished is obvious all around the grounds. In fact, ARAMARK�s "Planet Evergreen" promise is to lead the way in resource management and sustainability. At the campground/RV park there are many examples of energy- and water-conservation features, recycled materials, and natural lighting. We were impressed, for instance, with the use of old railroad ties � recovered from an abandoned railroad line beneath the great Salt Lake � used as pillars and beams in the campground store and adjacent facilities. We marveled also at the convenience benches made of re-cycled materials, yet looking very much like traditional wooden seats. Located just a quarter mile east of ARAMARK�s Lake Powell Resort, campers and RVers � some who trailer their boats to Powell � can easily access the activities and amenities of the entire area: fishing, swimming, watersports, boat tours, boat rentals, a fully stocked sports store, the marina store, overnight boat slips, a gas station, and a repair and parts shop. Also within an easy distance of the Wahweap Campground/RV park are the relaxing Driftwood Lounge and the renowned Rainbow Room Restaurant as well as a unique gift shop at the Lake Powell Resort. There is possibly no other destination in the state that offers as much to the RVer and camper � both on the grounds themselves and beyond. While at Wahweap, it is easy to arrange tours to area attractions such as Carl Hayden Visitor Center at Glen Canyon Dam, the John Wesley Powell Museum, Antelope Canyon (slot canyons), and Horseshoe Bend Overlook. And, of course, there are easy day trips from Lake Powell to other enchanting areas of the Southwest: Bryce, Grand, and Marble canyons; Monument Valley, and Zion National Park. What more can I say except to urge you to experience this wonderland for yourself. More information on Wahweap Campground/RV is available by calling (800) 528-6154 or (928) 645-1059. Outside the United States, dial (602) 278-8888. 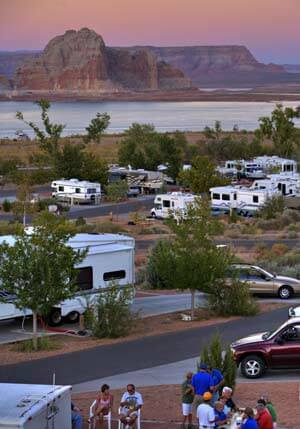 Editor�s Note: Wahweap Campground/RV is managed by ARAMARK, an authorized concessionaire of the National Park Service at Glen Canyon National Recreation Area.